So here's where mama hen and her chickies are at now. 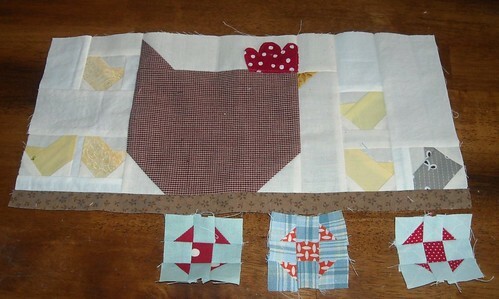 I am thinking I will probably make two more, maybe 3, of the shoo-fly blocks to fill out the bottom border row. My ailing deadline for this is March 1 so I am going to work on this now until it is done--meaning no getting sidetracked with other projects! this is going to be VERY cute! I love how it is coming along. Your colors are WONDERFUL! Keep us posted and can't wait for that hen tutorial! Very cute little quilt! It will be fun to see it all finished!